The Laughing Owl was medium-sized owl with no ear-tufts that was endemic to New Zealand, but is probably now extinct. It was also known locally as Whekau. Description: Facial disc was white behind and below the eyes, fading to grey with brown stripes towards the centre. Eyes were dark orange. Plumage was yellowish-brown striped with dark brown. There were white straps on the scapulars, and occasionally the hind neck. Mantle feathers were edged with white. The wings and tail had light brown bars. The tarsus had yellowish to reddish-buff feathers. Size: Length 35.5-40cm. Wing Length 26.4cm. "A loud cry made up of a series of dismal shrieks frequently repeated" - this sound gave the Laughing Owl its name. "A peculiar barking noise... just like the barking of a young dog"
"Precisely the same as two men "cooeying" to each other from a distance"
Others describe the call as a high pitched chattering, only heard when the birds were on the wing and generally on dark and drizzly nights or immediately preceding rain. Various whistling chuckling and mewing notes were observed from a captive bird. 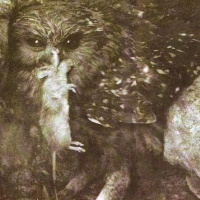 Hunting & Food: From studying pellets, it has been determined that these owls ate beetles, lizards, small birds, rats and mice. Laughing Owls were apparently ground feeders, chasing prey on foot. Breeding: Began in September or October. The nests were lined with dried grass and were on bare ground, in rocky ledges, fissures or under boulders. Two white, roundish eggs were laid, measuring 44-51 x 38-43 mm. Incubation took 25 days, with the male feeding the female on the nest. Habitat: Generally Rocky, low rainfall areas. Also in forest districts on the North Island. Distribution: North Island: Specimens were collected from the forest districts of Mt Egmont (1856) and Wairarapa (1868). Sighted in Porirua and Te Karaka. According to Maori tradition, they also occurred in Urewera. South Island: Low rainfall districts - Nelson, Canterbury and Otago. Also Central mountains and possibly Fiordland. Specimens were collected from Stewart Island in 1880. Status: Almost certainly extinct. Extinction was caused by persecution, land use changes and the introduction of predators such as cats and dogs. European settlers first arrived in New Zealand in 1840, when the Laughing Owl was plentiful. Specimens of the Laughing Owl were sent to the British Museum where reports on them were published in 1845. By 1880, they were becoming rare, and the last specimen recorded was found dead at Blue Cliffs in Canterbury in 1914. There have been unconfirmed reports of Laughing Owls since then, but no specimens. 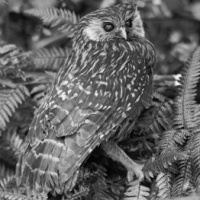 In his book "The Wandering Naturalist", Brian Parkinson describes reports of a Laughing Owl in the Pakahi near Opotiki in the 1940s. Laughing Owl egg fragments were apparently found in Canterbury in 1960. Original Description: Gray, George Robert. 1844. (The) zoology of the voyage of H.M.S. Erebus and Terror, during the years 1839-43 (Voy. Erebus Terror 1 Birds): p. 2, pl. 1. Olliver, Narena. 2000. "Whekau, The Laughing Owl". NZbirds.com. See also: Other owls from Oceania, Genus: Sceloglaux.